Home Expert Advice Skincare Advice Sun Care What Is a Sunburn? 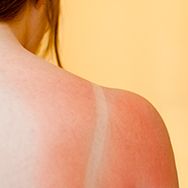 Sunburns are perhaps the most obvious form of sun damage. But they aren’t just the classic lobster-red color we associate with a long day spent outdoors; even slightly pink skin means you have a sunburn. If you have a darker skin tone, tender, itchy skin is also an indicator—you might not even see a change in skin color. UVB (shorter-range) rays cause most sunburn, and are the common contributor to most skin cancers. UVA (long-range) rays go deeper into skin, and are primarily responsible for signs of premature aging such as wrinkles and sagging. Over time, the visible symptoms and discomfort of a sunburn fade, and your skin will either return to its normal color or tan (there’s no such thing as a healthy tan, by the way; any change in skin color means you’ve suffered sun damage). We know the info above is pretty scary, but there is an easy way to prevent sunburn. The best way is to apply a broad-spectrum sunscreen rated SPF 30 or greater, and apply it liberally every two hours when you’re outdoors.